Columbia High School: Birth of a Building » James Betelle, Where Are You? I’m used to seeing old photographs of schools when they were new and pristine, set against the barren terrain that is indicative of fresh construction. And as my recent tour of Newark showed, it makes for an interesting contrast with contemporary images, where the landscape is overgrown and the school itself may be in various stages of decay. But what about the first stages of life? 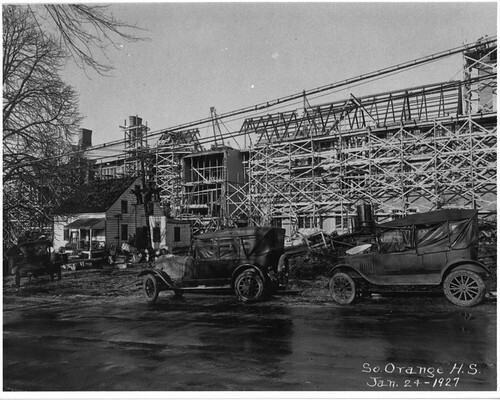 A great find I made was a series of construction photographs taken of Columbia High School over a roughly three-year period, from 1925 until 1927 when it was completed. Except for the vintage cars, machinery and external scaffolding, it looks like any typical construction site; mud, wood, concrete and workers standing around. 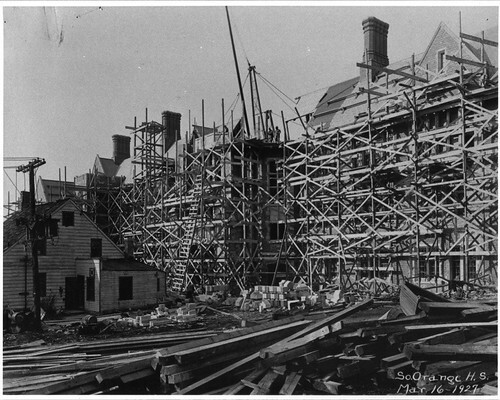 The photos were probably intended for utilitarian insurance record-keeping purposes, but today offer a rare look at the creation of a school building. The following photographs are courtesy of the Newark Public Library. This first photograph is merging of two shots taken at the same time in March, 1925 from the roof of the Fielding School, a grade school that had been built in the 1910s. The view shows the plot of CHS, encompassing the front entrance on Parker Avenue all the way to the area of the athletic field. A number of the houses in the distance still exist. 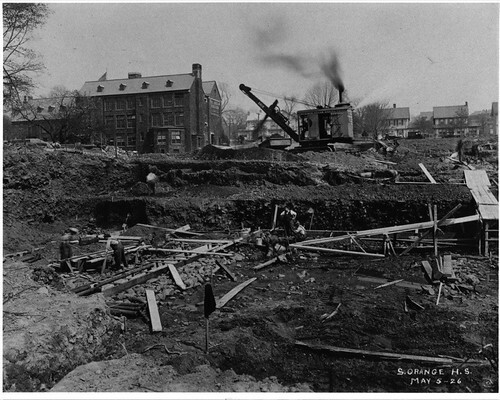 May 5th, 1926, we see a steam shovel and workers digging the foundations. In the background is the Fielding School (now the South Orange and Maplewood Board of Education Offices). 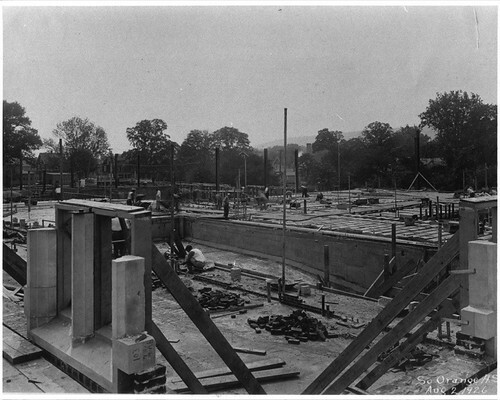 June 19, 1926, a cornerstone laying ceremony was held. James Betelle was in attendance, who, according to the program, was honored with the “Accceptance of Stone”. This rendering of CHS is a rare look at the entire front facade in plan view. This program is part of CHS’s archives. By August, the footings are down and windows are being framed with their limestone surrounds. Note the pool being built in the middle. January, 1927. The framing for the pitched roof and iconic central tower are taking shape. The house positioned awkwardly in front of the building remained there throughout construction. My guess is it was used as an command center for the contractors. February 3, 1927. It’s a month later, and the eastern elevation is taking real shape. The cloistered row of windows on the first floor were the industrial shops (finished view). They have sadly since been cut away for one of the modern additions. 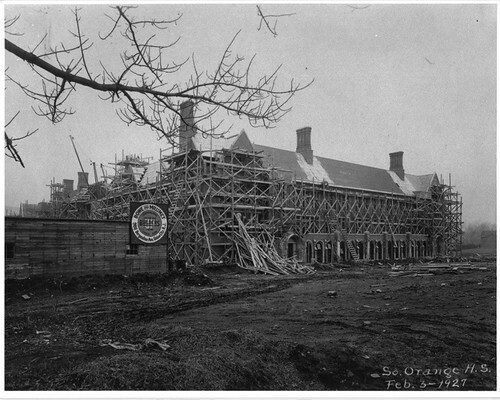 March 16, 1927, and the front facade is taking shape, but the tower is yet to rise above the roofline. 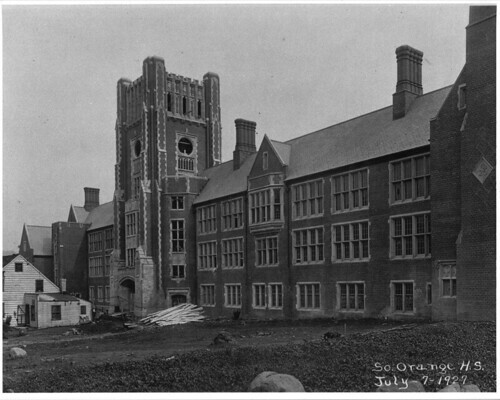 July, 1927, and the exterior is mostly complete, save for the missing clockworks and windows of the tower. By the following Fall, CHS was opened for classes. Fascinating… wish I had seen these and the other pics of the schools while I was attending in the 70’s. I’ve never been in the tower. Is it possible to arrange a tour of it? I’m hoping to do so, but that would be attached to me research. I’m not sure if they would do it for those simply curious. Couldn’t hurt to try, though! I had homeroom in the tower. Nothing much to see. Great research. I will share with my old HS buddies. This is really interesting to look at! I graduated in 1973. I believe I had a great education. Thank you to those that had the foresight to build this awesome high school. I graduated in 1970 and had no idea how well I was prepared for college by the education I got at CHS. I wrote a paper at Columbia about wanted to work for IBM. Last year I retired from 34 years of working at IBM. Columbia was outstanding. 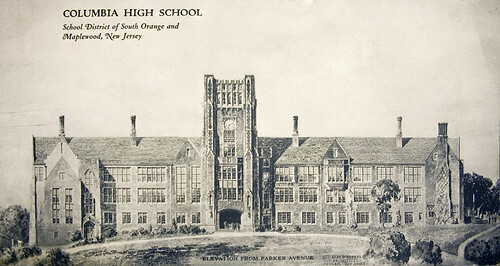 I also graduated in ’63 and had homeroom in the tower my senior year. There was an ugly 1970 addition at the back of the building that didn’t affect the appearance from Parker Avenue, but now there is a modern wing right on Parker that is a real abomination. I was trying to find a photo of this disaster on the internet to show someone, but could not. I guess they are rightfully embarrassed at what they did to a grand old building. My mistake; the modern addition on the back of the building was there when I was there in the early 60s, so it wasn’t a 1970 addition. That’s what I get for writing before drinking my morning coffee! Paul – That rear addition is actually the first the building received, in the early 50s. It was designed by firm of Krahmer & Behee. Both gentlemen had worked for Guilbert & Betelle. As additions go, it’s not the worst; the materials and finish are in keeping with the original structure, and in fact Betelle had designed the rear of the building to be extended (not precisely as had been done, however). This is some great information you have here. I attended CHS in the mid-90s and I’m very fascinated by this. The picture you have in the above link is actually where the B-Wing joins the original structure. The B-Wing is the addition that runs alongside Academy Street. The D-Wing is the most hideous appendage in my opinion and is the one that extends lengthwise from the front fascade of the building out towards Valley Street. There is a small faculty lot in front of it. I was in the tower a few times while I attended school there and as most have said there isn much, except at the top. On the way up I recall only one room above the third floor level (where the rest of the original structure stops rising). It was a large room and most likely the one that a few have said they had homeroom in. It hadn’t been used in quite some time and was very dirty/dusty and mostly empty except for a few pieces of worn old living room furniture. I’m not sure where that may have come from or when it would have been put there. Above that you would walk past the clockworks which haven’t been functional for awhile and then up to the observatory. There was a swivel mounted telescope that was meant to look at the stars when the copper roof was cranked open. Neither appeared to have been used for years and it’s possible the roof had been sealed to avoid leaks. You know I hadn’t seen that page yet when I wrote the response and was actually going to say that if you were still looking for a tour of the tower Alan Levin would be the one to give it to you! My mother was a teacher in the district for over 30 years, many of them were spent at Columbia. She retired in 2003 but was a colleague of Mr. Levin’s and he was actually my physics teacher while I attended. I believe he said then that the telescope was in need of some servicing in order to be usable again but that may have been done since. I do, however, recall that one of the times I climbed the tower was for the “egg drop” experiement in his physics class. Have you tried to explore other parts of Columbia? It’s really quite an amazing building. There is a sub-basement of sorts underneath the auditorium and the swimming pool that has an almost ‘catacombs’ type feel to it. It’s where the plumbing for the pool is located and some of the servicing for the ventilation to the auditorium. My mother was also a long time teacher in the district. She taught art, and finished out her last ten years or so at CHS (she left before your time). I don’t recall yours though, sorry. Back in the day I explored the catwalks under the roof, but alas never made it under the stage, which was a rite of passage for stage crew members. She taught Spanish and Latin at CHS and both middle schools so unless you took those elective courses it’s unlikely that you would. I’m really glad to have stumbled upon your site here. I’ve always been quite fascinated by the history of Maplewood/South Orange and especially Columbia. You’ve got quite a wealth of information about it, even the entry of the floorplan in the Encyclopedia Brittanica and the John Marshall school in LA. Do you have any more information about Columbia or the town history that’s not here on the site? Hi- my parents both graduated from Columbia HS – I think ’48 and ’49. My dad says the swimming pool was like the one in the movie “It’s a Wonderful Life” where the floor opened to reveal the pool beneath. Has anyone heard of this or seen photos? Nope, not true. It’s a standard pool. Thank you – maybe my father was making the point that Columbia had a “state of the art” indoor pool when we were watching the movie, and I assumed he was referring to the retracting floor. I know that he and I both share the same disappointment in the decline of US public schools. At the time he went to Columbia I believe both the school and it’s campus were considered to be one of the country’s finest. Many thanks for your help. I don’t know much about the pool itself, but it was a major feature of the school, and I believe at the time considered an advanced feature for a public school. So in that sense, perhaps it was “state of the art”. Really pleased to see this site. Though not an alumnus, I was the Head Librarian at CHS from 1987-2009. Ironically, unknown prior to my arrival, I eventually learned that my M-in-L’s family (Beach) actually donated the property “for perpetual educational purposes.” They also had declared, if not used as such, the town “must return the land to the family.” Hence, I always said, if they ever shut down Columbia, “the school goes to ME!” Also, in the last picture listed, the structure in front of the school is the Beach Family’s home. Lastly, the floorpan, and front photo, are listed in the 1927 ENCYCLOPEDIA BRITANNICA as an example of ‘perfect school structure.’ That volume, as well as number of the structure’s building procedures are also within the school’s Archives Collection. Nice to hear from you, Joe (sorry so long to reply!). Funny you mention the Britannica in the archives, I actually donated that after hunting down a copy from a book reseller. The archive’s original copy had gone missing some years earlier. Steve: When did you donate the Britannica? Curious, because it was there ‘before’ I was working at CHS. Never had any info about it arriving, so I just assumed it was ‘always there.’ Hope it did not go missing after I left as I made sure it was kept in secure case. At any rate, as previously mentioned, that aspect was a PR item I always used whenever speaking about the place. Also, the Library, though recent (70s) is very large and multi- functional . We, 1989, had it fully tech integrated. Literally, had numerous Library folks (public and school) come to look us over when they were thinking about upgrading their places. Those folks came, obviously, mostly from NJ, but we had a few from PA and a number of visitors from NY checking it all out. Laughing as per the 3/25, 1/27, 3/27 & 7/27 construction photos, I am looking at the Beach’s house. I used to joke with students that “My ancestors (actually in-laws) used to sleep where the flag pole is now.” Appreciate seeing these things after my time is no longer there. Yes, though not an actual alumnus – having worked at CHS for 22 yrs it sure is a deep part of my life as well!